We're rolling in just under the wire with the last of our flashback countdowns to QEII's big day! We've hit one visit from each decade of her reign, and - in a happy coincidence - we have just one left from the current decade to cover here: South Africa in March 2010. Jewel-wise, this state visit included some specially selected pieces, and even a couple we have not yet covered here. To start, however, she left her signature piece of jewelry at home. 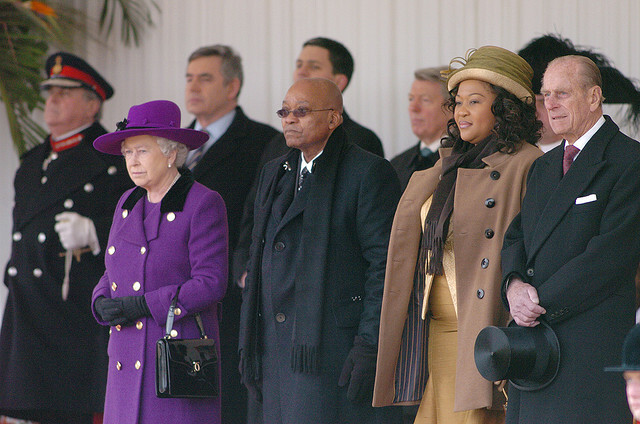 The buttons did all the talking as The Queen and The Duke of Edinburgh welcomed the President of the Republic of South Africa and Mrs. Thobeka Madiba Zuma to London at the beginning of their state visit. She more than made up for a brooch-less start by basically doubling the size of her usual brooch selections for the state banquet. The Queen Mother's Lily Brooch is popularly referred to as the "foot long" brooch, because, well, it's enormous! The brooch, which was made by Cartier for Queen Elizabeth (the future Queen Mother) in 1939, was positioned opposite her Royal Family Orders and Garter Star to hold South Africa's Order of the Companions of O.R. Tambo. This banquet was the brooch's first appearance since The Queen inherited it in 2002. Her Majesty's "best diamonds" - the South African Necklace and Bracelet, a present from the South African government for her 21st birthday - were a special and sentimental choice for the banquet, and a nice match for Queen Alexandra's Kokoshnik Tiara. I believe her diamond earrings are a smaller pear drop pair, The Queen's Pear Drop Diamond Earrings, but it's difficult to tell. Among the tiaras to spot in this video: The Duchess of Cornwall in the Greville Tiara, with her Pear Drop Diamond Demi-Parure Earrings, her Royal Family Order, and an emerald necklace likely from Saudi Arabia (and not yet covered here). The Queen donned one final significant selection to bid President Zuma farewell. This peacock-style brooch of multi-colored stones was commissioned by the South African government and given to The Queen by Nelson Mandela. It, too, has not been covered here in depth. To see a gallery from this visit, click here.